Miami native Tatiana Canelas joined The Children’s Trust in 2018. She holds a bachelor’s degree in early childhood education and a master’s degree in public administration from Florida International University. Prior to coming to The Trust, Ms. Canelas worked as the project coordinator for Quality Counts at the Early Learning Coalition of Miami-Dade/Monroe; she more recently served as a program coordinator at Redlands Christian Migrant Association (RCMA) as a program coordinator. There she provided leadership and support for the professional development of the education staff, and worked directly with migrant and seasonal families in obtaining needed services. 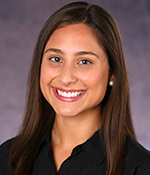 In her spare time, Ms. Canelas enjoys traveling, kayaking and spending time with her family and friends.